Brutalism is a post-war architectural style that descended from modernism and was most popular during the 1950s to the mid-70s. Examples of brutalist architecture can be found across Europe, and in the United States, Australia, Israel, Japan, and Brazil. One of the most defining features of this look is the use of raw concrete that makes the building appear as though it consists of many identical modular elements. They are unpretentious and often a bit stark in appearance. Feeling curious? Culture Trip introduces ten of the most representative brutalist buildings in the world. 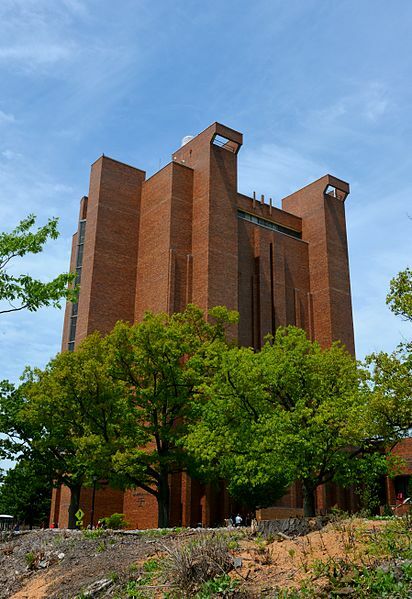 Located on Cornell University’s central campus, Bradfield Hall was completed in 1969, and is the tallest building for miles. Architect Ulrich Franzen conceived and executed its brutalist design. It is 11 stories high and mainly houses labs for various scientific departments at the university. Since many of these rooms must be climate controlled, there are no windows on the first ten stories of the building! The 11th floor contains the Northeast Regional Climate Center, one of six climate centers like it in the country. Bradfield Hall was included on the list of the 10 most spectacular university buildings published by Emporis and featured on CNN in 2014. 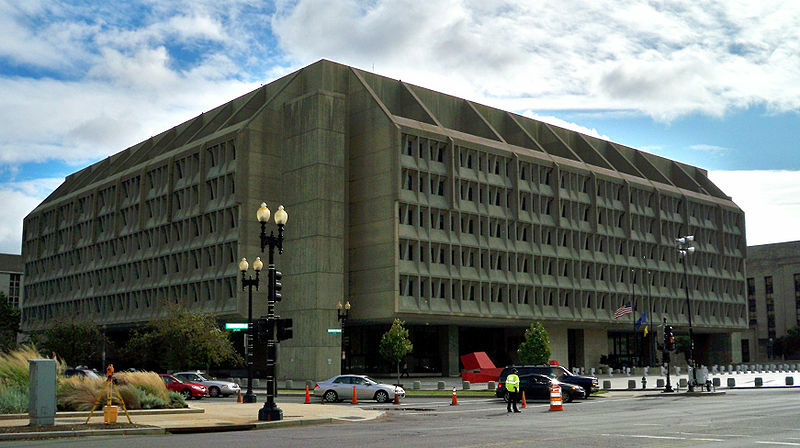 The Hubert H. Humphrey Building is a low-rise brutalist structure located in Washington DC. It is the site of the United States Department of Health and Human Services, and it was named after a former vice president of the United States. Marcel Breuer designed the building, and it was completed in 1977. While Bradfield Hall cost less than $7 million, the Hubert H. Humphrey Building took more than $30 million to complete. It would have cost upwards of $10 million more, but much of its interior was prefabricated. The building is balanced on a few strategically placed columns, and it was mandated that it be set back 135 feet from the road so as not to block the views of surrounding buildings. 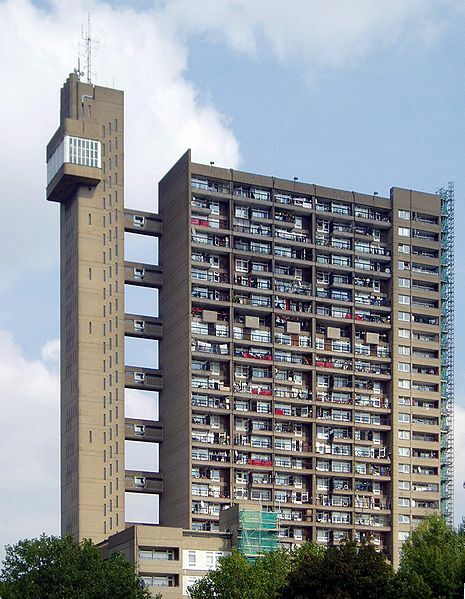 Perhaps one of the better-known brutalist buildings, Trellick Tower is a 31-story structure located in London. Completed in 1972, architect Erno Goldfinger designed it based on another one of his buildings in East London, Balfron Tower. One of its defining features is the tower that is linked to the main building at every third story via a small corridor. The building contains more than 200 apartments that are, for the most part, public housing units. This sort of mass housing setup fostered many social issues, including anti-social behavior among residents, as well as violent crime. Since its beginnings, Trellick Tower has undergone many social reforms to improve the quality of life of those who live there. 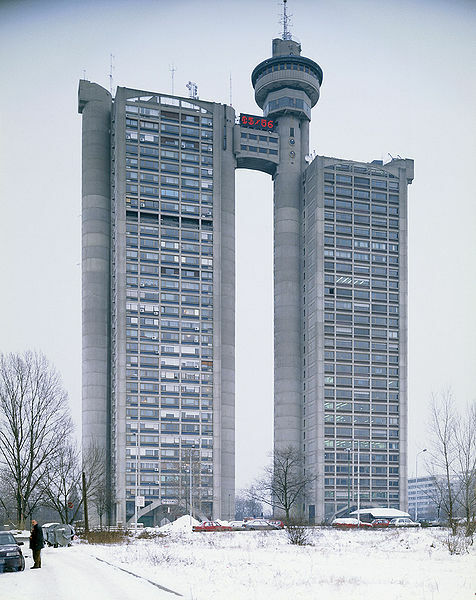 Built in 1977 and opened in 1980, Western City Gate is a Serbian skyscraper. Architect Mihajlo Mitrović designed it in the likeness of a high-rise gate meant to greet those arriving to the city from the west. It is 35 stories high and 140m tall. The building is composed of two towers, connected with a two-story bridge at the top. There is a revolving restaurant at the very top, and the towers house Genex Group and residential apartments. The building has even earned the nickname “Genex Tower” for this reason. Another noteworthy brutalist building in London is St. Giles Hotel. Architect Elsworth Sykes is behind the hotel’s design, and its city-subsidized construction was completed in 1977. The building is comprised of four main structures, and the rooms are arranged to create a saw tooth pattern. While the exterior may appear looming and stoic, the configuration of the windows allows for each room to receive plenty of cheerful natural light. 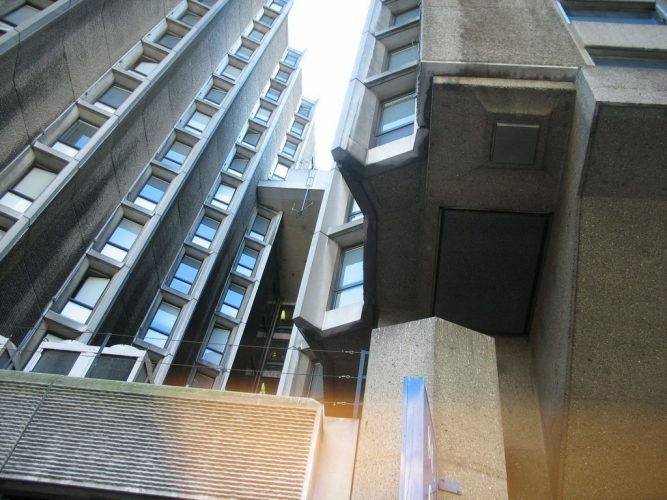 St. Giles Hotel is located in proximity to several of central London’s other brutalist buildings, including Camden Town Hall Annexe, Brunswick Centre, and London University. 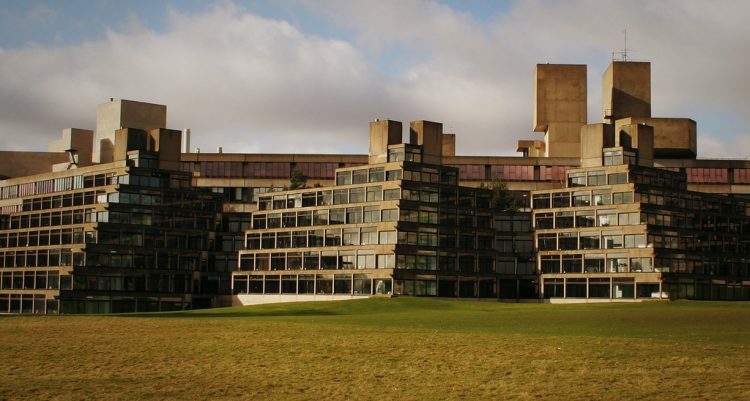 The famed British architect Sir Denys Lasdun designed the terraced residence halls, along with a few other buildings on the campus, in conjunction with the “new brutalist” style. The residence buildings are referred to as the “Ziggurat Halls” because their structures were, in fact, clearly inspired by the ancient Babylonian ziggurats. The buildings are made of concrete and glass, and were built between 1962 and 1972. Because of its brutalist buildings, University of East Anglia’s campus is considered to be a place of important architectural significance. Designed by Israeli-Canadian architect Moshe Safdie, Habitat 67 was created conceptually to address apartment living in modern cities. A work of Safdie’s McGill University thesis in 1961, the apartment complex came to fruition in 1967 in time for the 1967 International and Universal Exposition in Montreal. Built of more than 350 prefabricated modules, Safdie sought to bring more affordable housing to urban spaces while also rethinking modern design. Safdie’s structure, inspired by legos, has since become world-renowned. 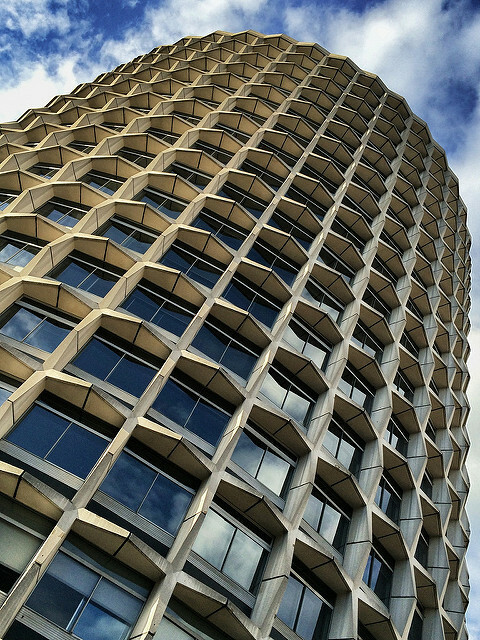 Previously known as ‘The Sixties Space House,” One Kemble Street is a brutalist building in London. It was completed in 1966, and Richard Seifert – who is also responsible for London’s Tower 42 – designed it. It was originally supposed to be almost twice as tall, and it was meant to serve as a luxury hotel. After objections from the city council, the design was adjusted to the drum shape it is known for today. The building rests on several Y-shaped pillars, a feature that adds to its space-age appeal. 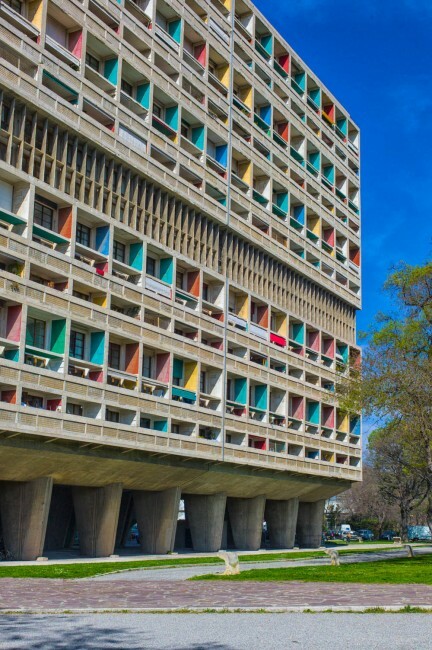 Cité Radieuse, meaning Radiant City, is the most famous of architect Le Corbusier’s Unité d’Habitation complexes. Opened in 1952, the 18-story concrete structure set the standard for many brutalist buildings to come and has been named a historic monument by the French Ministry of Culture. Cité Radieuse houses more than 330 apartments, as well as a hotel, rooftop terrace and two shopping streets. Le Corbusier’s other Unité d’Habitation buildings can be found in Berlin and Nantes, France. Nicknamed fondly as “The Toast Rack” due to the successive arches at the top, the Hollings Building was completed in 1960, and is primarily constructed of concrete and brick, which is evident in its rust-red coloring. 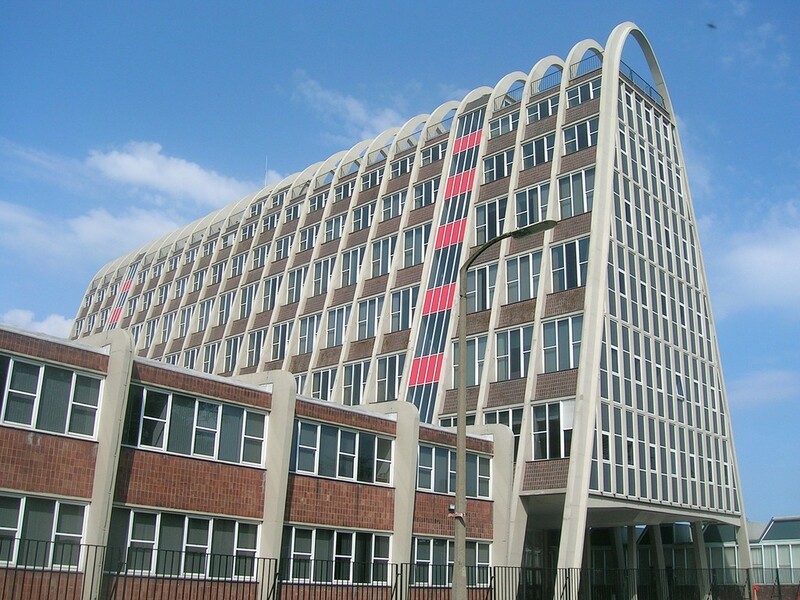 Leonard Cecil designed The Toast Rack, and it was part of the Manchester Polytechnic Metropolitan University, where it aptly housed the school’s Catering College until 2013. The Hollings Building was sold for £5 million in 2014 to the real estate development company, Estrela Properties, which will likely renovate it.